How to Play Foosball ? Foosball is nothing but a soccer game that is played on a specialised table. To simplify, it is a tabled form of soccer in which players move the ball with the help of protruding rods to which figures are attached. It is played by four players and the team with maximum score at the end wins the game. 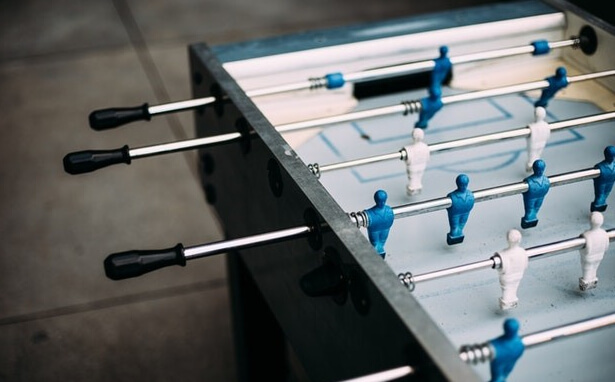 Foosball is considered as a game as well as a sport and is played indoors as well as outdoors. It is a game because it is similar to soccer and it is a sport because, in the last few years, many professional players have involved and established it as a game. It has a very easy concept and for this reason liked by many across the world. Similar to the field soccer, the main objective is to defend your goal and attack, to score as many goals as possible. The players stand on either side of the table and have to manoeuvre rods fitted with figures and control totally 13 player figures to defend their goal and at the same time take the ball towards the target goal. The team with most goals, in the end, wins the game. The winner can also be decided by the number of rounds a team wins. A Foosball table is rectangular in shape and just as a soccer field; it has a line of defenders and offenders. There are four protruding rods to which player figures are attached and are controlled by the players playing the game. The position of player figures can only be moved width wise of the table. While just looking at the Best Foosball table, it looks like an easy straightforward game but it is tough to master it. At the start, a ball is put through a hole in the middle of the table just like field soccer and the players control their respective rods to take the ball towards the opponent’s goal. Basically, in a game/ match of Foosball, the players have to score 5 goals to win the game. The players/ organisers can also alter the number of goals to win accordingly. A player needs a lot of time and effort to master the game. It takes years of practice along with right mental skills and tools to be able to compete with top professional players around the world. A player should develop strategies and techniques while practicing that can be helpful while playing with the best players around the world. The player should also keep playing with experienced players and take tips to learn quickly.